>Following morning you asked if sister Candle wants to leave her temple and northern parts of Fillydelphia. 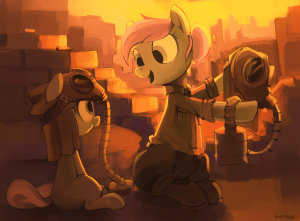 She refused, stating that she needs to bring light to ponies still living among ruined and charred buildings. You left her in peace, she gave you a blessing. >Soon you were back at your dad's, where another important question awaited you. He asked if you want to move in to live with him. You explained that you had friends on the other side of the river and you needed to ask them first. He was dissapointed, however he was also reasonable and let you decide who will be the one to move. Sunray to you or you to Sunray. >It was a hard decision, but you solved this problem by choosing staying with your friends in relatively safer area than moving to your father and risking some possible big consequences. Dissapointment of the pegasus didn't disappear, nevertheless he still was giving you an opportunity to act according to your own decisions. >You said your goodbyes and left his place, returning to your friends - thanks to courtesy of oh so nice Scurvy. However they were forced to seek shelter in some school turned to refugee camp due to intense fighting in their vicinity. Fortunately, you found Clean and Kalina, then you reported all the events to them, also discovering that Bunia didn't join survivors and she wanted to see you. >You decided to not let your neighbours know that it is safe to return. It was better to let them stay in a community they are forced to be involved into, you judged. >Right after you and Hran get back at your block - it was still standing where it should - you went straight to Bunia's flat, only to find a note that she was waiting for you in a service station not too far away.